iPad Pro, Apple’s newest and largest tablet, is now finally available. The device is a hybrid between a laptop and a tablet and it delivers far more than just a larger screen. While iPad Pro may not replace your laptop, it can surely complement it. The giant iPad comes with a number of great features. To help you learn more about it, we’ve gathered the iPad Pro specs that will make your experience worthwhile. Launch: It was announced in September and released in November 2015. Display: It has a 12.9 inch (diagonal) Multi-Touch display, with a 2732×2048 resolution of 5.6 million pixels, which means a pixel density of 264 ppi. This makes iPad Pro the most pixel-dense iOS device yet. Body: Despite its incredible size, it’s only 6.9 mm thick and weighs 713g (Wi-Fi) and 723g (LTE). Finish: Like the iPad Air 2, it’s available in three colors: gold, silver, and space gray. Chip: It features Apple’s brand new A9X chip which offers outstanding performance and a 1.8x faster speed than the previous A8X chip. Memory: The device is available in three versions: the 32GB and 128GB Wi-Fi models and the LTE-equipped 128GB model. Sound: The tablet boasts a four-speaker audio system which will enhance your sound experience. Camera: It is equipped with a primary camera, the 8MP iSight Camera, and a secondary one – the 1.2 MP FaceTime HD Camera. Sensors: It contains a variety of sensors: Touch ID, three-axis gyro, accelerometer, barometer, and ambient light sensor. Power and Battery: It has a long life-battery of up to 10 hours of surfing the web, watching videos or listening to music. Platform: Its operating system is iOS 9, the world’s most advanced mobile OS. 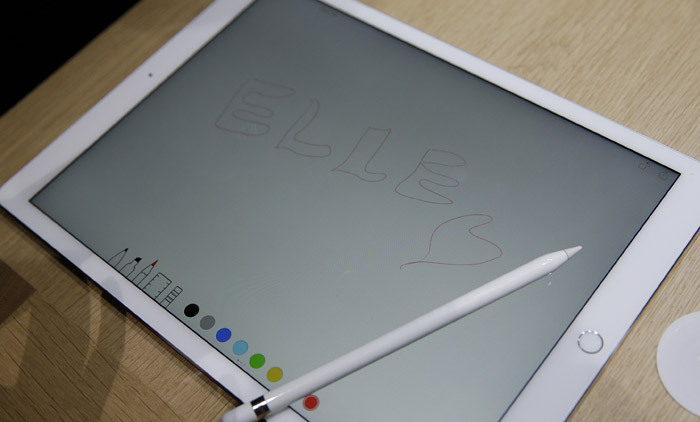 Accessories: The Pencil is also part of the iPad Pro package. It’s an active battery-powered device which reproduces your writing and drawing with all the nuances expected and with maximum precision. With a huge display, 4GB of RAM, an amazing A9X chip, and an extra large battery, iPad Pro masters it all. If you found these iPad Pro specs helpful, check out more on iPads on our website.